Is a Hollywood film studio a set for the paranormal? 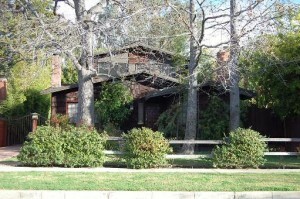 Many locations around Hollywood are reported to be haunted, especially at Halloween. There are theaters, hotels, night clubs and studios that have their share of ghost stories. Whether you believe in ghosts or not, the possibility of a spirit continuing on after death is fascinating. 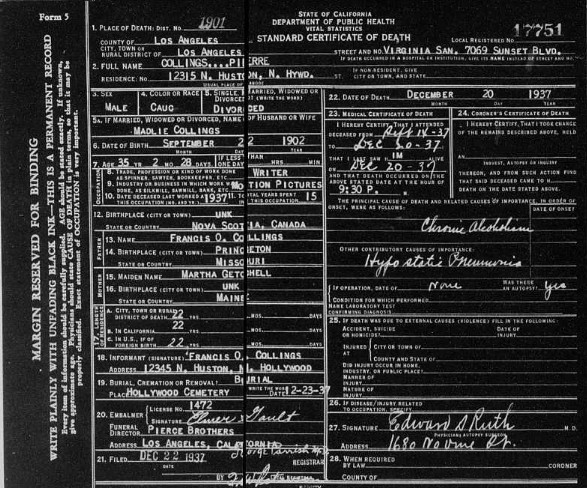 There are countless paranormal stories about Hollywood’s past. 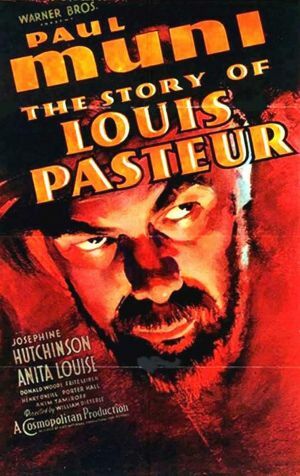 One story in particular, which originally had nothing to do with ghosts, had the blaring Los Angeles Times’ headline: “Death After Studio Party Called Accident by Police.” The story reported that a 31-year-old studio electrician was fatally injured after a wrap party attended by several well-known film stars. 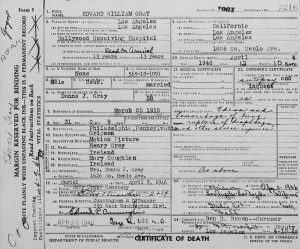 According to the news report, Edward W. Gray, the father of three, was found near death on the floor of a film stage near midnight on April 3, 1946. He was dead on arrival at Hollywood Receiving Hospital. Original accounts stated that Gray may have been murdered, but a deputy coroner eventually discounted that theory. Upon examination, it was found that Gray suffered a fractured pelvis, numerous internal injuries, a skull fracture and facial lacerations. The coroner said that such injuries could only be attributed to falling from a great height or, — being run over by an automobile! 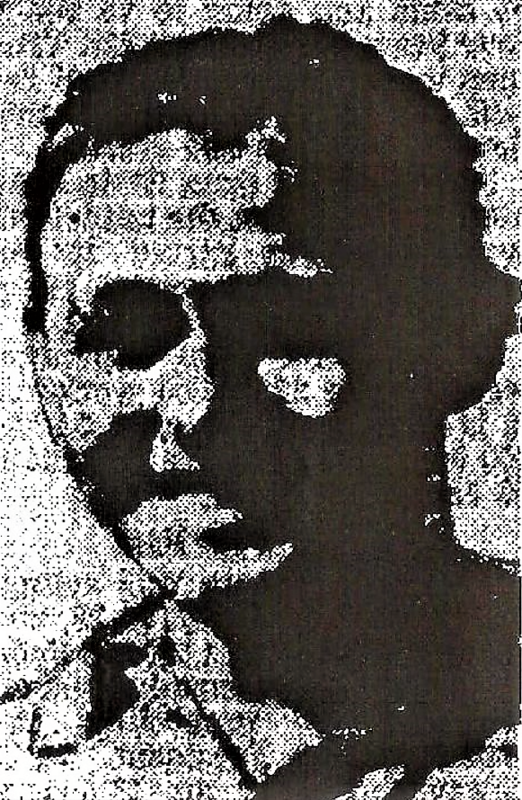 A ghostly image of Edward Gray from the Los Angeles Times report on his death. 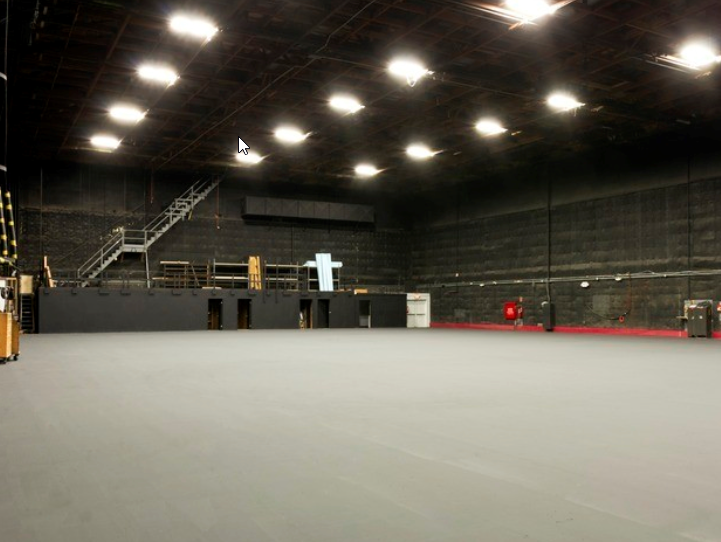 Gray was found on the studio floor below a catwalk, 65-foot above. A ladder rose to the catwalk at one end, and police theorized that Gray had climbed to the top, then tumbled off. Supporting this theory was the discovery of blood on a two-by-four jutting from the backdrop fifteen-feet above where Gray’s body was found, and would have been in the direct line of a fall from the catwalk. It was also found that Gray’s blood registered an alcohol content of .29 – today a .08 is considered intoxicated. 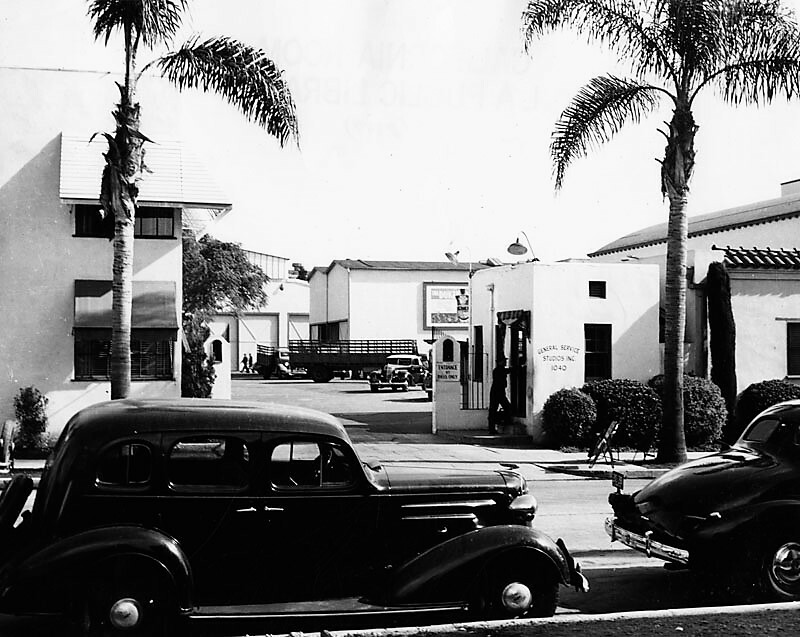 The studio where this happened was a rental lot at 1040 N. Las Palmas Avenue, which at the time was called General Service Studios (later known as Hollywood Center Studios). 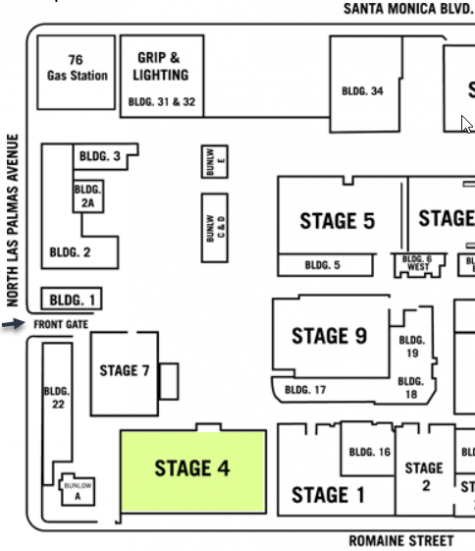 In May 2017, the lot was sold and renamed Sunset Las Palmas Studios. 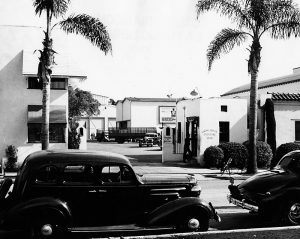 Founded in 1919 by set designer John Jasper (1876-1929), three production studios were built on 15 acres south of Santa Monica Boulevard. 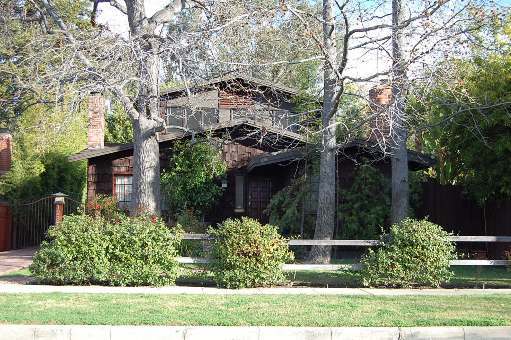 Billionaire-producer, Howard Hughes filmed Hell’s Angels here; the television shows, Ozzie and Harriett, Green Acres, The Beverly Hillbillies and the first two years of I Love Lucy (Studio 2) also called this lot home. Shirley Temple made her film debut here, and it may also be remembered as the ill-fated Zoetrope Studios founded by Francis Ford Coppola in the early 1980s. 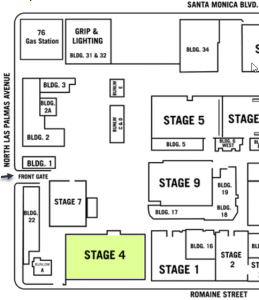 Edward Gray fell to his death in Stage 4 (highlighted). The studio entrance is only a short walk from there. Laurie Jacobson recalled a similar story, but it happened on a different stage. “In 1946, a studio worker fell to his death on Stage 4 making the film Stairway to Hell,” she said. 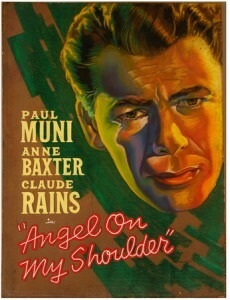 “For many years after, there were technical problems on that stage.” That was the year (1946) that Edward Gray, the electrician in the Los Angeles Times article, fell to his death during the wrap party for Angel on My Shoulder, which, at the time had the working title – Stairway to Hell. There were enough questions about Gray’s death that an inquest was held. Reportedly, Gray and another friend were “uninvited guests” at ‘a gay party’ that was hosted by the film’s star, Paul Muni to celebrate the completion of the film. Neither Gray nor his friend had worked on the film, but showed up anyway. The party began at 6pm with a bar set up on the sound stage. More than a score of tables had been arranged in front of the papier-mâché reconstruction of “Hell” – a familiar scene in the film. “Did you see any drinking?” asked Dep. Dist. Atty. 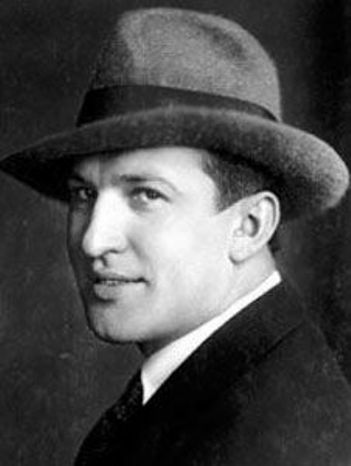 S. Ernest Roll. Muni told the jury that he didn’t know Gray, although other witnesses said he sat at Gray’s table for a while. Muni and his wife Bella left about 7:45pm. Muni added that he didn’t see anyone intoxicated. Anne Baxter said she also left the party early after posing for pictures on the film set where the bar and tables had been set up. “Some people were drinking, others eating at steam tables,” she recalled. Three cases of Bourbon, a case of Scotch and four cases of beer were consumed, according to the caterer. “Wasn’t there any liquor left?” inquired Deputy Coroner Frank Monfort. “Oh no, nothing was left,” the caterer replied. A recent image of the studio’s entrance. Further testimony disclosed that after the taxi incident, Gray had climbed the high backdrop, and from there he either stumbled or fell, even though no one actually witnessed Gray climbing to the catwalk. Studio officials emphasized that everyone had left the studio long before Gray was found. According to the caterer, the party ended at 8:45pm when the liquor supply was exhausted. 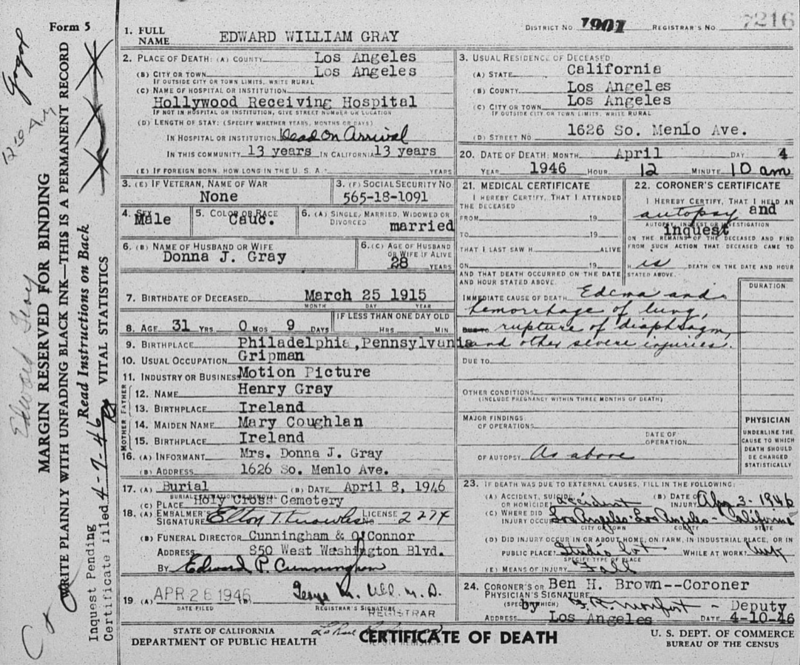 Gray’s widow was represented by future Los Angeles mayor, Sam Yorty, who argued that the dead man may have been in a fight, or run over by a car. However, expert medical, scientific and police testimony claimed his injuries were most likely caused by a fall. 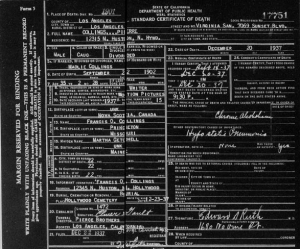 Edward W. Gray’s death certificate (click on image to enlarge). 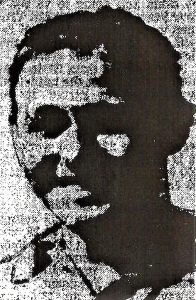 And in fact, the nine-man jury found Edward Gray’s fatal injuries were “received from a fall while intoxicated.” To this day, family members still dispute the jury’s findings. 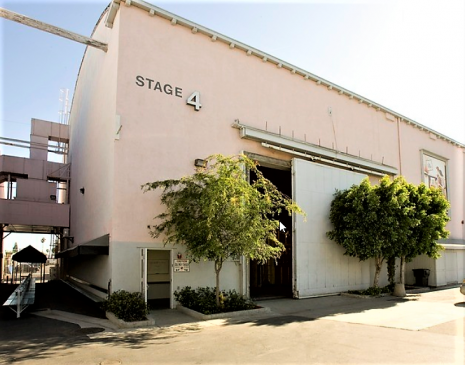 Could Edward Gray be haunting the sound stages of the Sunset Las Palmas Studios? Perhaps he was murdered and his soul can not rest. Unlike the characters of the film whose wrap-party he crashed, instead of hell, he chose to walk the rafters of the studio that was his last memory. So this Halloween, take a walk past the gates of Sunset Las Palmas Studios, and perhaps you will see the ghost of Edward Gray hailing a taxi instead of returning to the studio – and to his death. 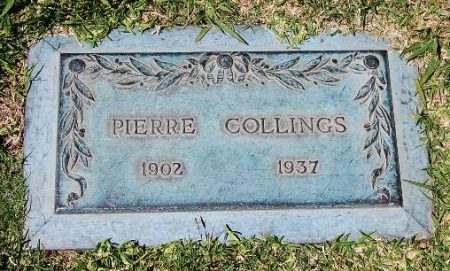 It probably comes as no surprise that there are many Academy Award recipients residing at Hollywood Forever Cemetery. 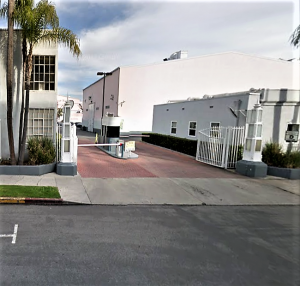 Many of Hollywood’s film pioneers rest there including several Academy of Motion Picture Arts and Sciences founders such as, Douglas Fairbanks, Cecil B. De Mille, Jeanie Macpherson, Carey Wilson, Frank E. Woods, Charles H. Christie and Jesse L. Lasky. Of those interred at Hollywood Forever, there are 45 nominees that received a total of 178 nominations. Of that number there are 33 awards that were received by 27 winners. The following are the recipients in the Best Picture, Best Actress, Best Actor, Best Supporting Actor, Best Director, and Best Screenplay categories and the Honorary and Irving G. Thalberg Awards. Nomination and award were posthumous. Finch became the first posthumous winner in an acting category. 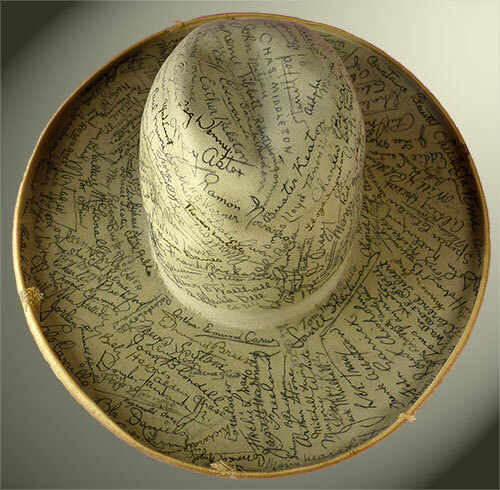 Shared with Ring Lardner, Jr. Refused to accept his award because of the antagonism between several industry guilds and the academy over union matters. This marked the first time an Academy Award had been declined. 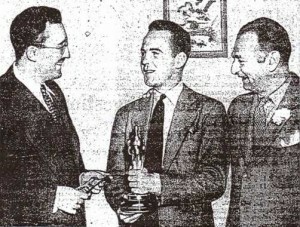 Academy records show that Dudley was in possession of an Oscar statuette by 1949. Recognizing the unique and outstanding contribution of Douglas Fairbanks, first president of the Academy, to the international development of the motion picture (Commemorative Award).